Heat oven to 425°F. In 13x9-inch (3-quart) glass baking dish, heat butter in oven 2 to 3 minutes or until melted. In small bowl, mix Bisquick mix, curry powder, garlic powder and ginger. Pour milk into shallow dish. Dip chicken into milk, then coat with Bisquick mixture. Place in baking dish. Bake 20 minutes; turn chicken. Bake about 10 minutes longer or until juice of chicken is clear when center of thickest part is cut (170°F). Meanwhile, in 10-inch nonstick skillet, mix sauce ingredients. Cook over medium heat 3 to 4 minutes, stirring occasionally, until mixture begins to thicken. Serve sauce over chicken. Sprinkle with peanuts. Entertaining? 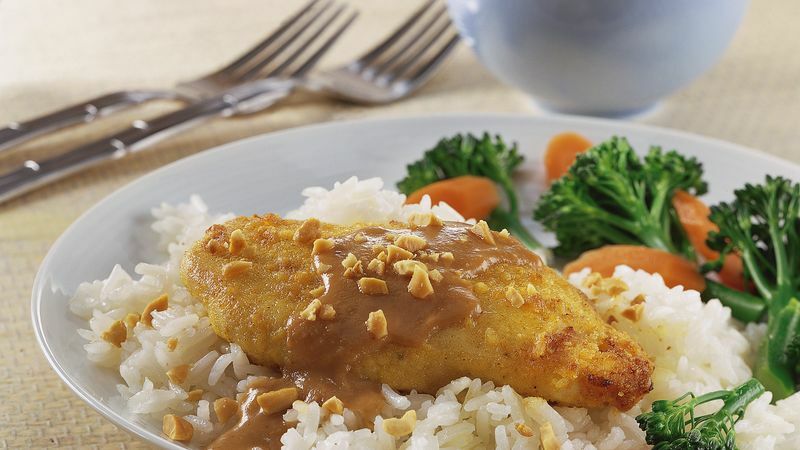 Serve this spicy chicken over hot cooked jasmine rice with steamed carrots and broccoli.